Yesterday we enjoyed a slight change of weather in Brighton. We left sunny Hampshire with it's morning temperature of 23 degrees and once we got truly beside the sea, the coastal mist swept in. It was a welcome change really, particularly for those in Queen's Park discovering the McDonald's #hellogoodtimes 'Football Gold' pop up event. Only minor squabbling over the inflatable football trophy! 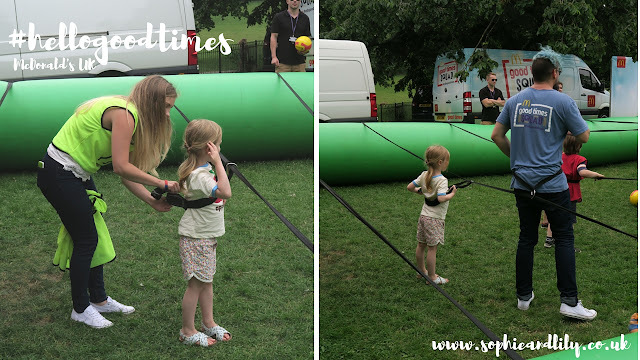 We were met by Gemma and the team who had brought all their kit in two McDonald's vans and we had the opportunity to see for ourselves what was available in the park to participate in before it got warmer and busier. The Football Gold featured music, a football stadium backdrop for a photo competition complete with trophy and ball props and an inflatable 'hit the cross-bar' goal post which was always popular. What made the event 'gold' was the addition of a giant inflatable human football table. I had never seen anything like it myself and Lily was keen to join in. She was not only the youngest team player at four and a half but a valuable member of the team which saw everyone getting active in the Brighton sunshine. 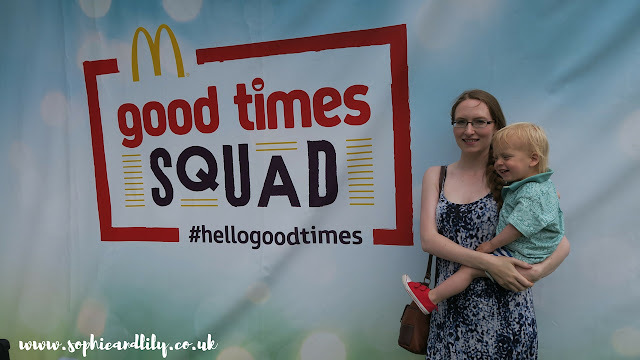 The aim of the #hellogoodtimes campaign by McDonald's UK is to provide a little something extra and spontaneous to enrich a regular day and of course enhance social interaction.There is very little promotion so they are a very pleasant, impromptu addition to someone's day. 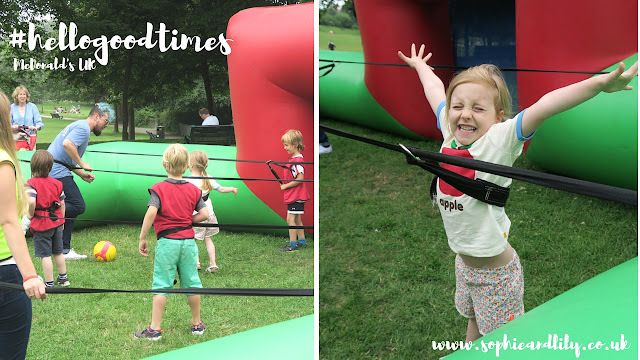 I was aware of quite a few people around the park who appreciated something extra for their children to participate in, especially as they didn't expect to find a giant human football table to play with, for free! 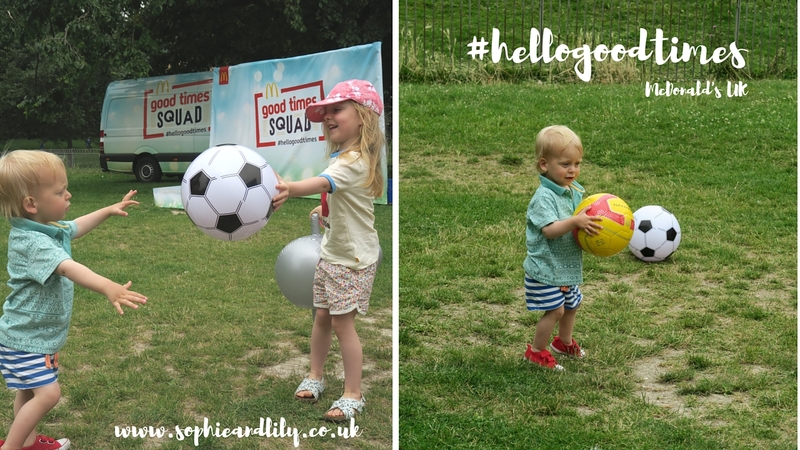 I can't praise the #hellogoodtimes Good Time Squad high enough for their friendliness and efforts in encouraging everyone to get involved, especially the youngest player of the human footaball table - Lily. There is a link you can use to find out whether one of your local McDonald's has any upcoming activity days. They run throughout the Summer holidays, until the end of August. For example, on Tuesday 26th July Tricketts Cross near Ringwood will have a family activity day. What can you expect? Games, balloons, stickers, to VIP appearances by Ronald McDonald himself, even surprise celebrity appearances in selected restaurants. Outdoors events could boast a number of different activities, for example, the 'Summertime Gold' event features air guitar competitions, McFlurry machines (always a crowd-pleaser on hot, summery days), photo booth to gain free McFlurry ice creams and a ball pit in which you have to find the #hellogoodtimes labelled white ball for a prize. It doesn't necessarily have to revolve around good weather, the McDonald's teams have also been handing out free ponchos at railway stations to commuters who aren't dressed for a change in weather, how nice is that! All the team players thoroughly enjoyed the new concept that was the human football table, and Lily even did some mid-match limbering up. Look out on social media for little hints on when the next activities will be held near you, alternatively they could be a little surprise during a day out which will prove to be fun for all of the family. This is a sponsored post: all opinions expressed are my own.